Have you ever panicked a bit when you had life throw you a loop? Or when you were planning a family vacation and knew it wasn’t your scheduled homeschool break? Now, of course…part of the beauty of homeschooling is that we can be flexible and change things as needed. I have taken advantage of that countless times over the years! Over this past year, we have moved, lived in a hotel for awhile between houses, and have taken a few family trips. All during our scheduled homeschool year! Add a new baby into the mix and things have been a little chaotic! I had our homeschool year all planned out last summer. And you know what happens us homeschool moms plan too far ahead, right? LIFE. So, life happened. And we got a bit off course in our homeschool. But…not all of us! If you don’t know already, my oldest is using Sonlight this year for the first time. I have already talked about why we love Sonlight, so I won’t list all the reasons here. But, I will tell you that not only did my son not get off track during all of our moves and trips this year; he thrived! I have been so thankful to Sonlight numerous times throughout this year, but perhaps one thing I appreciate most is how easy it is to travel when using Sonlight. My son was easily able to pull out what he needed for school each time we traveled this year, and was the only child to actually “stay on track” due to that. I have an Instructor Guide and he has a student Guide and everything we need for each week is laid out for us. Sonlight graciously provided me with a full curriculum level in exchange for my honest reviews. All opinions are my own. When we knew we were going to be on the road while homeschooling, I pulled out my son’s Student Guide with him, it took minutes to get everything together for our trips. Sonlight provides daily lesson plans, so you can see at a glance what materials you’ll need for the week. Even on those times where we traveled for more than a week at a time, it was so simple to grab our Sonlight guide and pull out the books we needed. Instead of taking the large Guides with us, my son kept the weekly lesson plans in a folder. He took only the books he knew he needed for the week/weeks we we going to be away, and made sure he had a pencil box with writing supplies, and he was ready to go. He was able to stay on schedule while on the road, even when some of my girls were not. I was honestly more concerned that he stay on track than my daughters, because he was in 8th grade this year. I can’t tell you how thankful I am that I didn’t have to worry once about him missing something while we traveled. He is also the type who likes to stick to a routine and getting off course really rattles him, so this was a huge blessing. My son put everything he needed in a backpack, and made sure he had his Sonlight lesson plans so we could check them off as he completed each day. It truly was that simple. It looks like we may have even more family travel in this upcoming year. 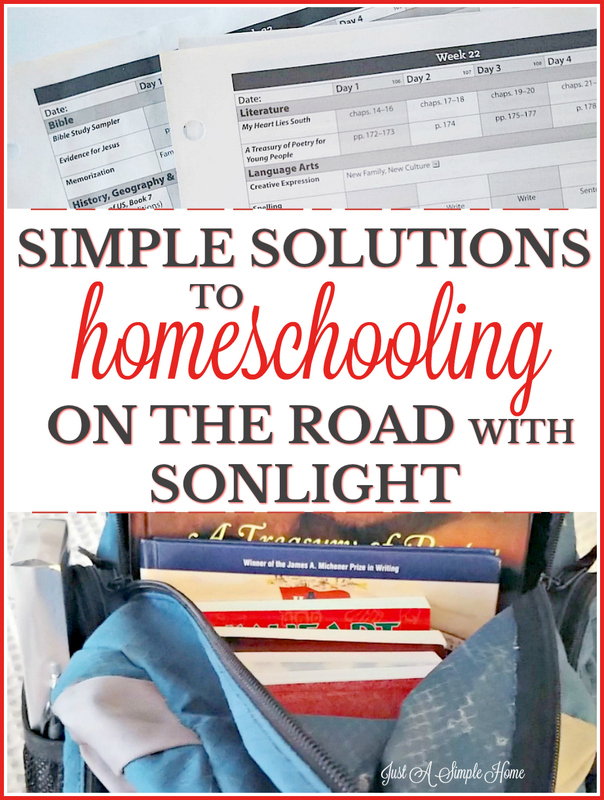 I’ll have more on that in upcoming posts, but I will tell you that I am now so much more confident about traveling as a homeschooling family thanks to Sonlight. Now, I can look forward to family travel with excitement, knowing my children will still be getting a fantastic education while on the road. HAVE YOU EVER HOMESCHOOLED WHILE TRAVELING BEFORE? IF YOU WOULD LIKE MORE TIPS AND SUPPORT AS A HOMESCHOOL MOM, SUBSCRIBE TO MY CHANNEL!